Mon Dieu! Can one learn the essentials of Spanish tapas at the French Culinary Institute? Apparently, the answer is a resounding oui! I can’t speak a word of Spanish. It’s been nearly two years since I took a hands-on cooking class at the French Culinary Institute. 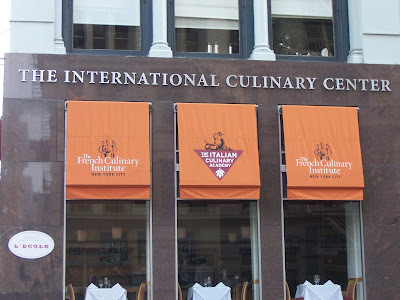 FCI’s gone through an extensive transformation and now offers instruction in French, Italian and Spanish cuisine in what is collectively referred to as the International Culinary Center. Privately, I wonder if I’ve still got my mojo. It’s been a while since the spit and polish drills of the culinary classroom. At least I’ve still got my uniform and my traveling kit of chef’s knives. Frankly, the decision to enroll in the course was also one of economics. Times being what they are, it was a lot more affordable to sign up for a two-part cooking clinic on Tapas Essentials in New York City, than invest in a trip to Spain. Consider it a little appetizer for a future culinary excursion. Although I had hoped for a little grounding in the history and traditions of tapas, the class of twenty-one students in white coats and white caps is immediately hurled into boot-camp mode. The direction has the desired effect. The students all snap-to, and I quickly find myself back in professional kitchen mode, as we scurry for onions and Red Bliss potatoes to prepare Tortilla Espanola. However, I am still clueless about tapas. Fortunately for you, dear readers, I have since done my homework. As I suspected, tapas is the name for small appetizers served throughout the various regions of Spain – bar food, to be exact. One story, proposed in the 1997 edition of Joy of Cooking, says the practice began in the sherry region of Andalusia in southern Spain in the 19th century. Small slices of bread were placed atop glasses in local taverns to keep the flies out of drinks. 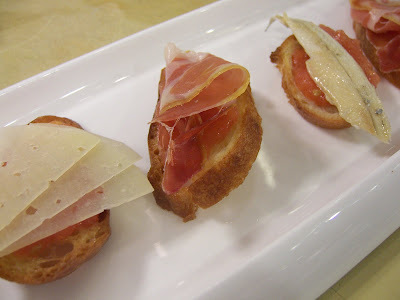 The word tapas derives from the verb tapar, which is translated “to cover.” Along the way, some entrepreneurial bartender started to top the bread with slices of ham. Others speculate that bartenders offered small bites of salty snacks atop drinks to make patrons thirstier. Consumption of tapas has become a cherished ritual in Spain, with different regions developing specialties from local ingredients. You eat tapas slowly and it should always accompany a glass of sherry, wine or beer. You savor tapas at a relaxed pace and take pleasure in life. During class, we are destined to violate this important cultural prerequisite. The pace moves quickly, and I pull out a notebook to scribble down Chef’s staccato directions. The kitchen is hot, I’ve missed my morning cup of coffee, my cap it on the tight side, and I’m concerned about the circulation to my brain. Chef assures us that he will try to follow the recipes in our book. “Sometimes I get too excited and do something else,” he confesses. I team up with an engineer from an Internet company in New Jersey and we start to assemble our mis en place. We set to work preparing Pan Con Tomate, or Tomato-Rubbed Bread. The dish comes from the region of Catalonia and involves grating ripe plum tomatoes into a puree and adding fruity Spanish olive oil. The tomato dressing has a lush, floral bouquet and is spooned over bread and topped with Serrano ham, Manchego cheese or anchovies. Aside from the irony of our frenetic attempt to prepare food that epitomizes leisure, it becomes clear that the success of tapas is all about the alchemy of simple rustic ingredients, bold flavors and precision technique. We sample Almendras Fritas, or sautéed almonds. Whole blanched Marcona almonds, sautéed in olive oil until bronzed, are considered essential at tapas bars. We puree tomatoes, cucumber, red pepper, garlic and sherry vinegar with extra virgin olive oil for chilled Gazpacho Andaluz. The gorgeous salmon-colored soup is fresh and audacious with pungent garlic, fragrant olive oil and tart sherry vinegar entangled in an exotic flamenco dance. Following his example, we combine browned potatoes with sautéed onions and eggs in a sauté pan. The process includes a precarious moment when one must invert the tortilla onto a plate, and slide it back into the pan to continue cooking. Some of our classmates get tripped-up by this step, but we manage the flip with dexterity and the result is respectably puffed and yellow, studded with savory onions and tender potatoes. Gambas al Ajillo is a simple preparation of garlic shrimp sautéed in a hot pan with olive oil, red pepper flakes and brandy. When the brandy is added, little bonfires erupt over each stove. 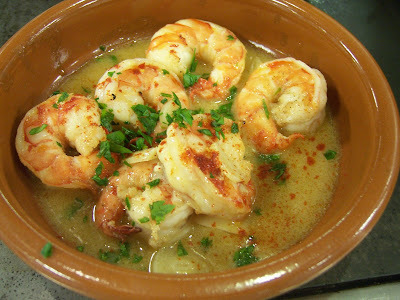 The shrimp is then simmer briefly with a little shrimp stock and served in a traditional terra cotta dish called a cazuela. I fret that I may have overcooked the shrimp, but the dish is wonderfully spicy and aromatic. He combines egg yolks and saffron with the olive oil and garlic mixture in a food processor, which becomes luscious golden-amber peaks. Prized saffron grows in several regions of Spain. 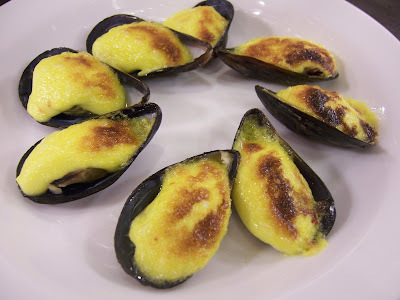 We lighten the concoction with whipped cream and spoon it onto briny mussels on the half-shell that are placed under the broiler. We eat our selection of tapas standing at our work stations, with no sherry, wine or beer in sight. School rules prohibit alcohol during class, but we’ve just committed a big no-no when it comes to tapas etiquette and international gastronomic protocol. A nice glass of ruby-red Rioja alongside those saffron aioli mussels would have really hit the spot. With any luck, I’ll avoid an entanglement with the Spanish Culinary Inquisition long enough to make it to our second session. Those mussels are calling my name. Sounds like a fantastic class TW! I'm curious about the way he made aioli in a blender though - looks like the no sweat route. 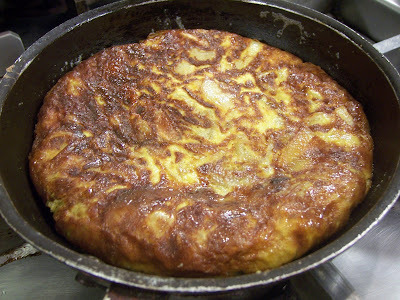 Beautiful tapas -- and a perfect tortilla espanola! I just hosted a tapas class in my kitchen, and I'm glad to know that although we committed one sin, by cooking many dishes in a short amount of time, we mitigated the sin by sipping sangria from almost the beginning of the class! Tapas satisfy my craving for "one bite of this, one bite of that" eating -- much more enjoyable to me than sitting down to one large dish of something. Wow, everything looks so good! I just received a Spanish cookbook as a gift and now am quite excited about having a look through it - thank you for inspiring me! Interesting class. The shrimp and the mussels look delicious. Which dish did you like the best? Veron - these dishes were great, and the mussels were pretty heavenly! I think you're right - no sweat method - just garlic straight into the blender, and it all gets the heat under the broiler. Lydia - I want to come to your next tapas class! I make a mean white sangria! Lidian - was the gift that new massive volume of Spanish recipes? I just got that too, and I'm itching to explore. Kathy - I always have trouble picking my favorite - but I would put it at a three way tie between the shrimp, the mussels and the gazpacho - all very easy and outstanding taste. Maryann - Thanks so much - my next job is to find the best Spanish olive oil I can find so I can make these dishes at home. oh, oh, oh! Did you get to make all these?I am sooo jealous! You have it made living in NYC, all this out your door! Ok, I am going back to school with you, cause we did not make things that looked that good, of course I was in a class full of under aged idiots who did not know their way around a kitchen.